Beyond mothering and understanding the mother in the Armodoxy tradition. 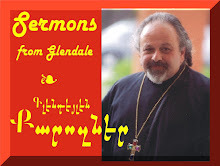 Sermon delivered and recorded LIVE on May 12, 2013 at the St. Peter Armenian Church & Youth Ministries' Center in Glendale, California. Special announcements regarding "Awarding"
Sermon delivered by Fr. Vazken Movsesian on 5 May 2013 - 10th Anniversary of parish gives opportunity to look back, honor the day and forge the future - on the abundance in life and how to ascend to the promised abundant life. Recorded LIVE at the St. Peter Armenian Church and Youth Ministries Center.